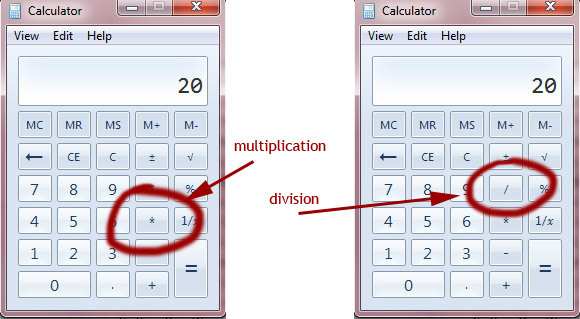 Where are the multiplication and divide symbols in Windows 7 calculator? This annoyed us for ages – we felt quite stupid for not working it out – but to be fair, the solution isn’t exactly blindingly obvious. Microsoft, in their infinite wisdom, decided not to use the tradition symbols for multiplication and division on the built in calculator on the Windows 7 OS. So how do you do it? First fire up the app (click the Start button, type ‘calculator’ in the search box, and in the list of results, click calculator), and in the default view, you’ll find the multiplication sign being represented by what looks like an asterisk “*”, and division being the forward slash “/”. Quite why they couldn’t just use the symbols that everyone is familiar with is anyone’s guess, but at least we can finally use the thing. Huzzah! The calculator in Windows 7 is actually quite a sophisticated beast: go to this page and you can find out how it can be used in Scientific, Programmer and Statistics modes, how you can convert values from one unit of measurement to another, calculate dates and calculate fuel economy, lease, or mortgage payments. This has always riled me too, but it’s standard programming practice if I recall from my fortran days. If a geek is inventing a calculator application I figure he’s going to use the language he wants to use. We’ll get over it. Never had a ZX Spectrum or ZX81, Mike? They were standard symbols for divide and mulitply in ZX BASIC, and I think it was used in other versions of BASIC too. Back in the day I think the traditional multiply symbol was considered too much like a letter ‘x’. I’m not sure what the problem with divide was- perhaps it was just hard to render on a basic display. This also matches what’s on your numeric keypad. with each new version of windows, it is more and more about the programmers needs. The requirements of the end user dont matter to Microsoft anymore. That is why we have unworkable library formats that the world hates, a windows 7 search that can’t find anything, and a network diagnostic tool that tells you to go online for a diagnostic answer if there is a problem connecting to the internet. An idiotic answer when the machine knows it has no internet connection!! Thank you so much..I felt so stupid because I could not figure this out! Me too plainjane. Why has everything become so complicated in this day and age.